1. 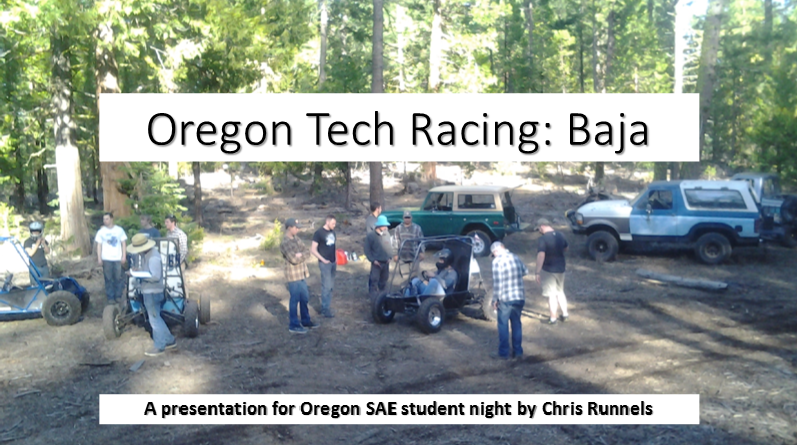 The BAJA SAE team from the Oregon Institute of Technology (OIT) in Klamath Falls takes part a single competition per year (the BAJA SAE West competition, which is usually held in Oregon or California). 2. The Formula SAE team also takes part a single competition per year (the one in Lincoln NE). 3. In the past, the Formula and BAJA teams used to maintain handwritten notebooks. 1. The BAJA team found it challenging to explain to the design judges, in the limited time provided, what was so special about the design of their subsystems. The team had hard time communicating their analysis in a clear and concise fashion. Some of their finite element analysis (FEA) files may have been missing from their progress report. 2. The BAJA team ran into problems that could have been prevented relatively easily back at Klamath Falls, by checking their vehicle against the judges score sheet. They experienced problems related to a leaking gas tank. They tried to combat it by applying three rolls of tape. The team believed it could have passed tech inspection more easily, if the team had checked their vehicle against the score sheet of the design judges, prior to heading for competition. 1. The BAJA team was quite encouraged to see all the FEA files linked into the Calculations & Analysis tab of the Ecosystem. The team liked the fact that the images imported were included in the exported reports. This would facilitate clear, concise and effective presentation of their risk analysis to the design judges. The students looked at the Ecosystem as a tool that could help them effectively convey, in the x min that they had inside the tent with the judges, what was great about their subsystem designs. 2. The BAJA SAE team liked the Gate Review tab of the Ecosystem. The team envisioned entering the items to be checked by the judges into the Gate Review tab. The participating teams would know in advance what the judges would be looking for. By verifying all the items, prior to heading for competition, the team expected less hassle with passing tech inspection, once on site. 1. The Formula team performed below expectations, largely due to lack of documentation, combined with absence of key personnel. 2. The lead for suspension and frame contacted the faculty adviser, early in the morning on the day when the team was set to leave for Lincoln, and told the adviser he could not go. 3. This left the faculty adviser in tough situation, because the suspension and frame systems had not been fully documented, and there was nobody to step in, esp. not on such a short notice. 4. The faculty adviser thought the Formula team would have made the design finals, if this had not come up. 1. The faculty adviser greatly valued the Ecosystem facilities supporting design documentation and knowledge transfer. The faculty adviser thought this had happened to other teams as well. Teams tended not to document their designs well enough. If the race car were to break down, what were the students supposed to do? The main people might already have graduated. One cannot always count on the original designers still being available. 2. The faculty adviser believed the Ecosystem would provide huge help to next year’s teams. The Ecosystem would provide teams with access to the reference designs used in the past. The Ecosystem would help the students capture the requirements and meet the rules for the subsystems. 3. The faculty adviser thought the Ecosystem could provide an effective way for defending the marketing presentation based on the Formula SAE rulebook. 1. 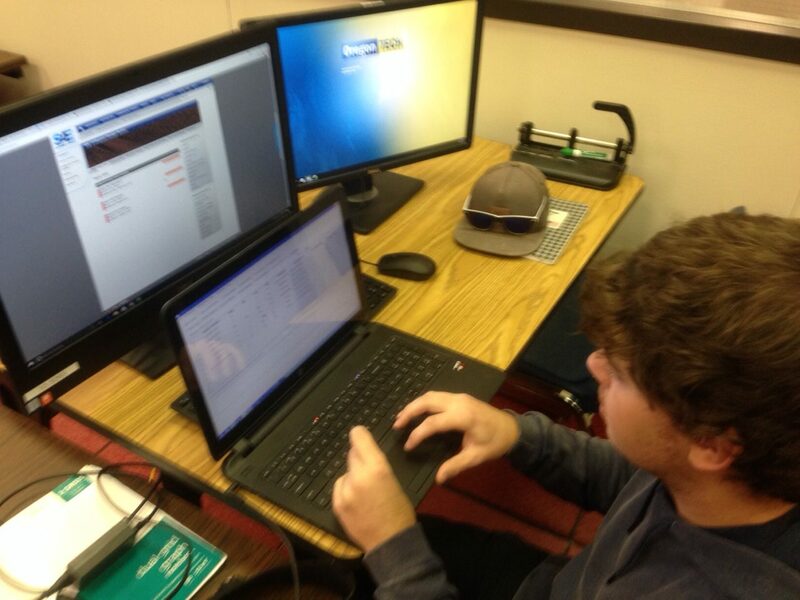 Students would not have a choice: They would be required to use the Ecosystem SW. The faculty adviser told his students to use the Ecosystem from Day 1. 2. We arranged things such that there is no risk of SW inconsistency problems during the academic year. Everyone was using use same version. 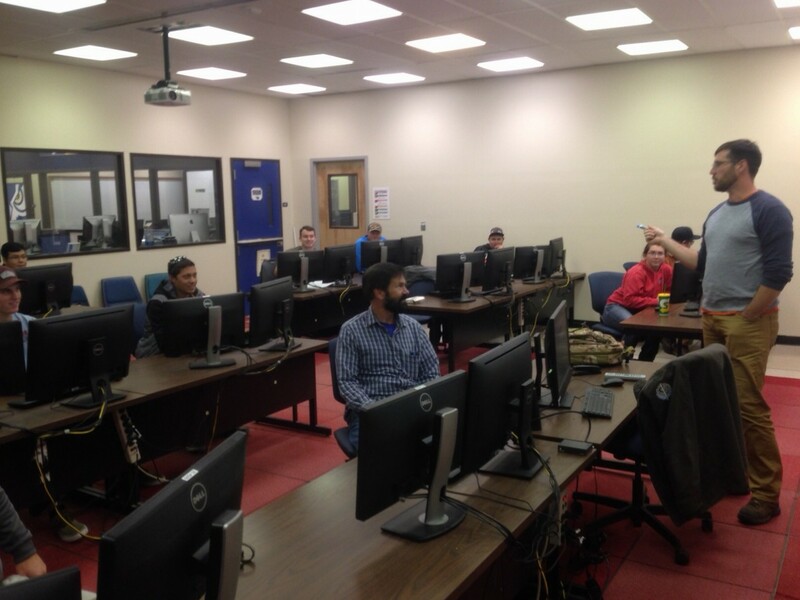 The students received training on the Ecosystem 1.09 SW in October 2017. There were no SW updated expected. 3. The Formula and BAJA teams had 3 years of design data to import into the Ecosystem. They might not do everything during the 2017 – 2018 academic year. They might add more next year. 1. 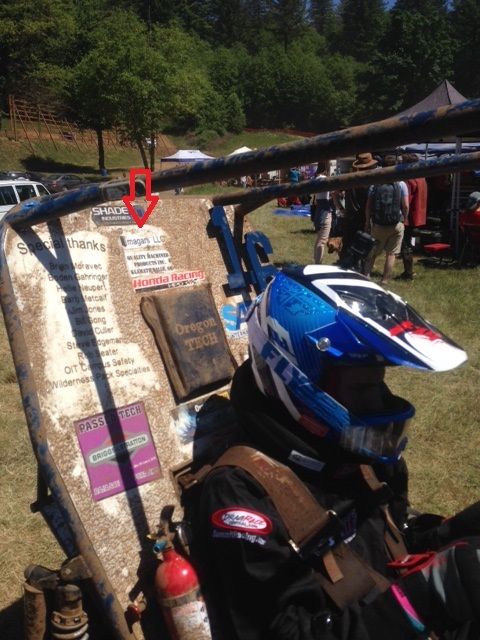 The BAJA team acknowledged “Imagars LLC” on their vehicle under “Special thanks”. 2. 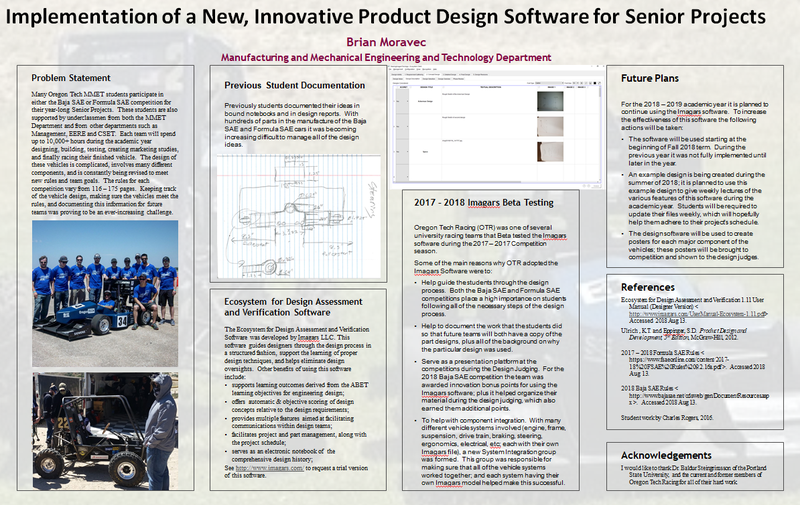 Usage of the Ecosystem SW earned the BAJA SAE 10 bonus points under a Design Innovation category.. Apparently, the design judges liked the organized presentation provided by the Ecosystem (systematic and thorough presentation of the design decision made along with supporting rationale), and decided award Oregon Tech for its contributions to improvements of the Ecosystem SW. The bonus points were understandably very well received by the BAJA SAE team. The BAJA SAE team at OIT Klamath Falls using the Ecosystem 1.09 SW during an Oct. 21 ’17 project planning meeting. Christopher M. Runnels, the team president is standing. The faculty adviser, Prof. Brian Moravec, is sitting next to him. Nathan Endner using the Ecosystem SW during the Oct. 21 ’17 project planning meeting.